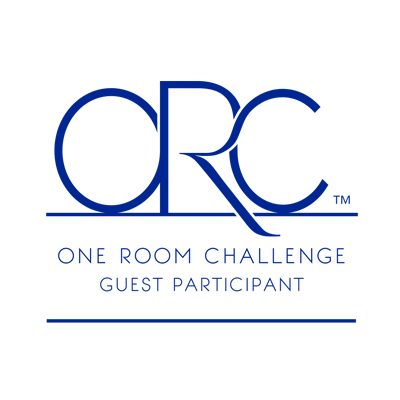 While my daughter is in Copenhagen learning the meaning of Hygge, I just got my own kind of cozy on with a simple and delicious party menu of comfort foods. For us non-Danes, hygge is roughly translated to mean coziness. 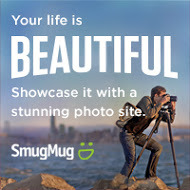 It means creating a warm atmosphere and enjoying the good things in life with good people. Hygge (pronounced ‘hooga’) is calling to me as our summer is slowly turning to fall. While the daytime sun is still shinning bright and warm in California, our mornings and evenings have taken to cooler temperatures – signaling to us that fall is coming. The crisp air is beckoning us to pull our sweaters out of the closet, gather with friends, and enjoy a meal together. This is the perfect time to enjoy a simple dinner of comfort foods. I was recently shopping in Cost Plus World Market. My daughter and I headed over there to find new bedspreads to change out her and her step-sister’s bedroom. Well, we didn’t walk out of the store with bed covers, but I did find these beautiful plates and bowls. The different hues of blue combined with the white and brown were calling my name. I simply loved the cherry blossoms! But there were two designs that I fell in love with. The Cherry Blossoms and an Indigo Blue set. Standing in the aisle I just couldn’t decide – so I mixed and matched the two! 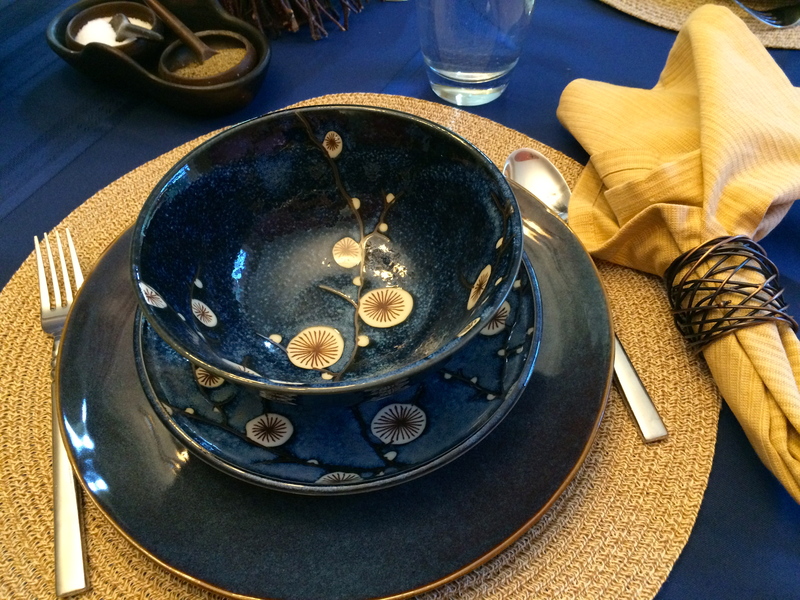 I finally settled on the Indigo Blue dinner plates, the Cherry Blossom salad plates and an equal mix of the bowls. I love the final look when I combined the two. World Market also had the woven place mats, metal woven napkin rings, and the twig and grass centerpieces. 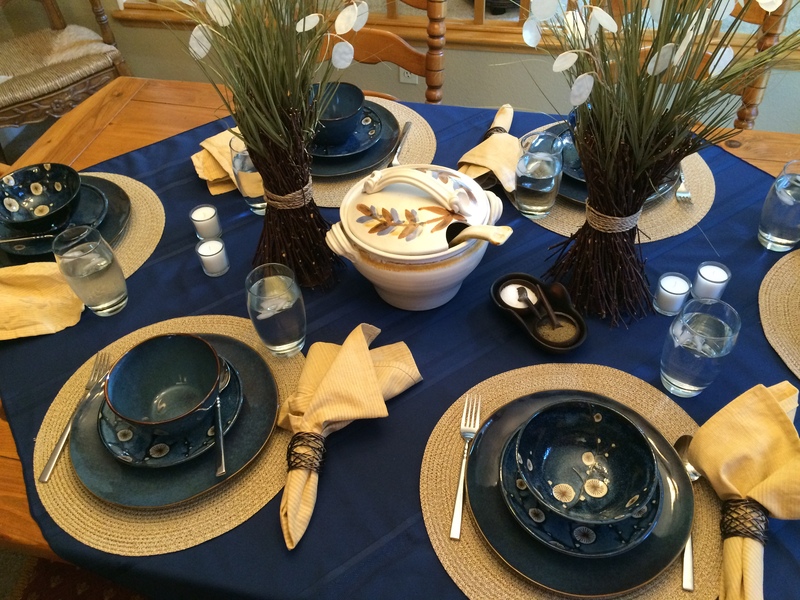 I simply added my blue tablecloth (52 inch squared) turned on an angle and my oatmeal cloth napkins. This continues the eclectic look of mixing and matching. I think it all worked together beautifully! Entertaining during fall calls for big bowls of creamy soup. These bowls are the perfect size! Served with “gourmet” grilled ham and cheese sandwiches and a crispy green salad – this menu is perfect for a casual gathering with friends. Oh, how I love fall! The soup is easy enough to make ahead and reheat when friends arrive. Just let it simmer on the stove. I have this beautiful soup tureen that was a gift from a friend 28 years ago! I love using the tureen both for my family and for company. Sandwiches can be grilled and kept warm in the oven. Then toss the salad, pour some wine, and really enjoy an evening of friends and comfort food. Your friends will thank you! Entertaining is not always about going all out with the menu. Sometimes simple is best. During the fall months your friends will love to get their cozy or hygge on with this dinner filled with comfort foods. 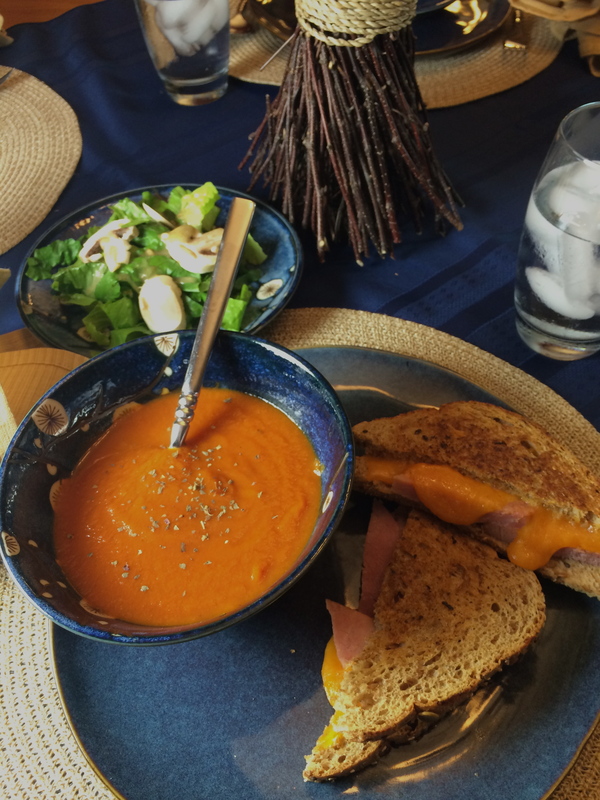 Red Bell Pepper and Tomato Bisque and Grilled Sharp Cheddar Cheese and Thick Ham Steak Sandwiches are a perfect combination. And oh, so delicious! Disclosure: This is not a sponsored post. I simply love entertaining and setting a beautiful table! I also love shopping at Cost Plus World Market – they help me express my unique style. I love your bowls! The soup looks yummy too! Thanks, Bonnie. I love the bowls as well. They are a really nice size for so many foods – pasta, cereal, ice cream, and of course the bisque. I love the placemats on your table! I’m definitely going to check out the soup recipe as well. Thank you, Pam. I bet you love the soup! What a beautiful set up! My girls love tomato bisque! They would eat it for every meal! Oh then you for sure need to try this recipe! I love the roasted red peppers! 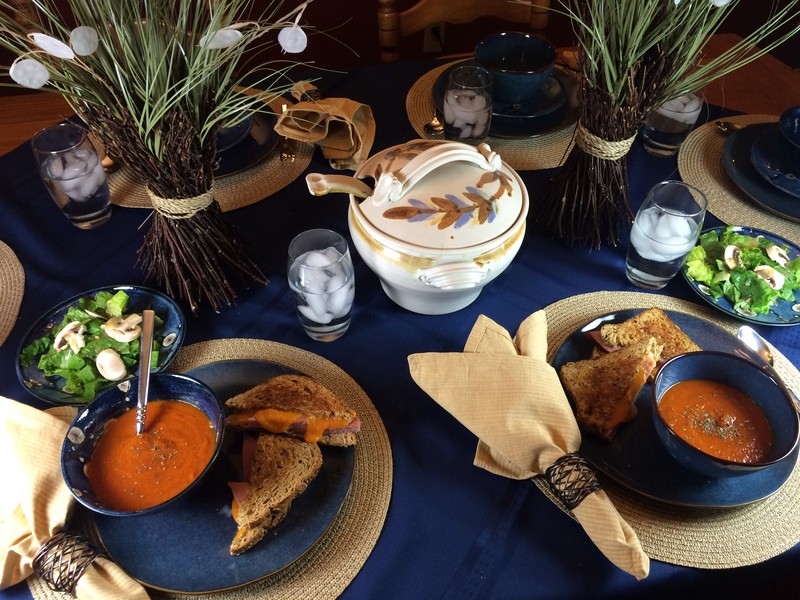 Tomato Bisque is my favorite soup and it looks amazing on your beautiful table. 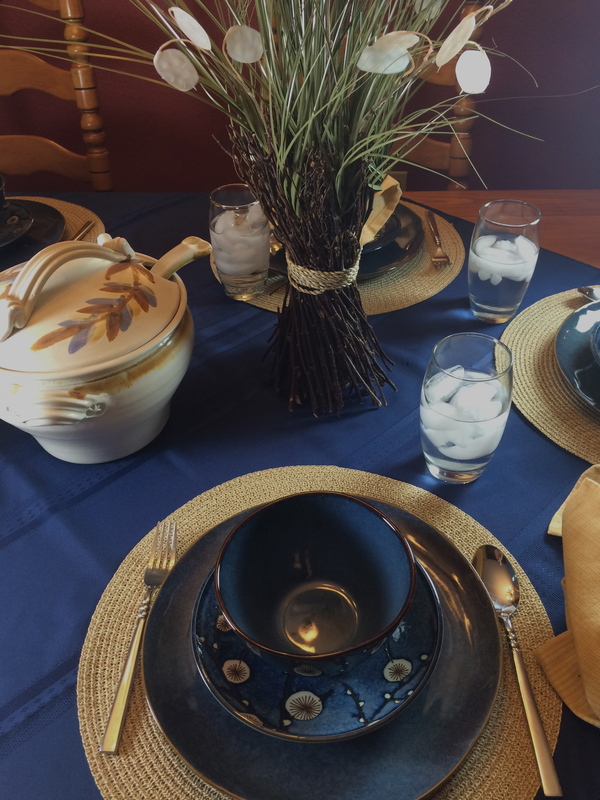 Stacey, you have created a wonderful table setting, so warm and inviting. I know your soup and grilled cheese sandwich is delicious. I am a bit hungry now staring at the melted cheese in the sandwich! Oh, Cynthia, the soup and sandwiches were delicious! Such an easy meal to put together, and honestly everyone loves comfort food! I absolutely love the design for your tableware…it reminds me of the fall. 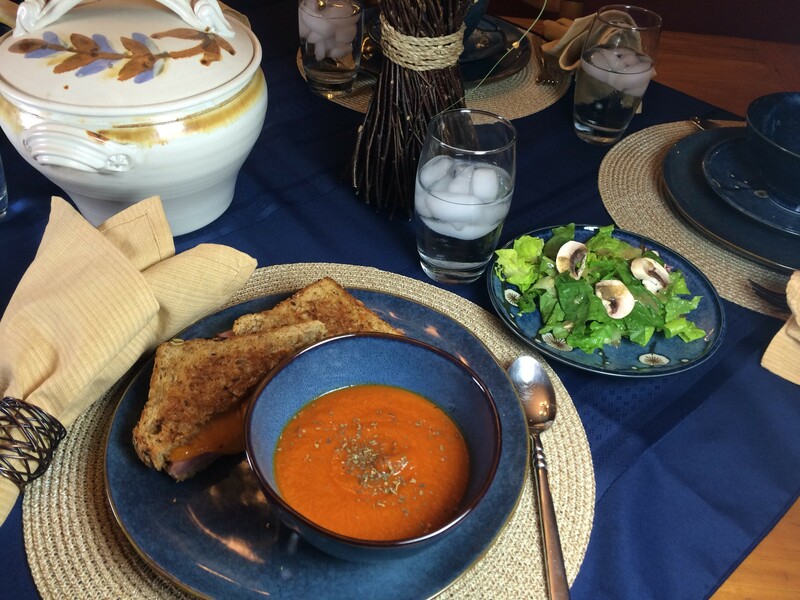 I love tomato bisque…it is so warming and filling. Thank you, Yona! I fell in love with the dinnerware walking through the store! That’s such a pretty table set up! Perfect colors for fall. Thank you! I am especially attracted to the blue as it matches my husband’s eyes! Wow how beautiful. Perfect, cozy and amazing for a nice Fall meal. I love this whole set up, so pretty. Love the blue as a fall color, it makes that red soup pop! Thanks, Michelle! When I first say the bowls I thought they would be perfect for my Curried Butternut Squash Soup, but then I saw this new recipe and I just had to try it! this table setting is beautiful! and that soup looks so yummy! Thank you Aaronica! I love shopping at Cost Plus World Market! I love the thought behind Hygge! Your tablescape is gorgeous, too! Thanks! I can’t wait for my trip to Copenhagen to experience hygge with the Danes. Your taste is flawless! I am in love with your table setting. 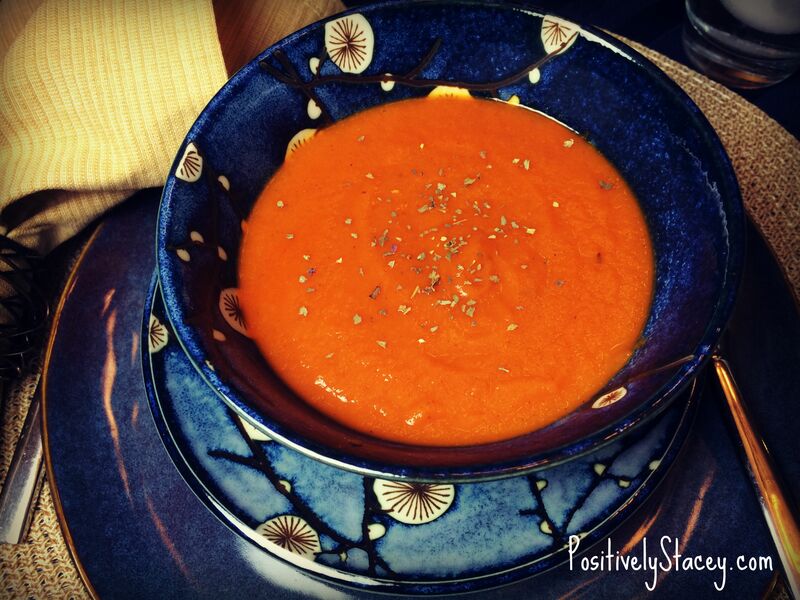 And your Red Bell Pepper and Tomato Bisque sounds like a MUST TRY. Yummmm!!! That tomato and bell pepper bisque looks heavenly and I love the table arrangements so classy. The bowls have a wonderful vine decoration too it reminds me of a vineyard. I loved the twiggy look of the cherry blossoms as well! It reminds me if nature in a, “Let’s take walk along a creek” Kinda way. What a gorgeous table setting and a delicious sounding menu! I love World Market and always leave there with something that wasn’t on my list. Thanks, Brittany! Yes, there is always so many lovely and fun times to find at World Market. What a cozy and warm meal. I’d love to share it with good friends. (and I love your choice in dishes, that you mixes the two different sets). 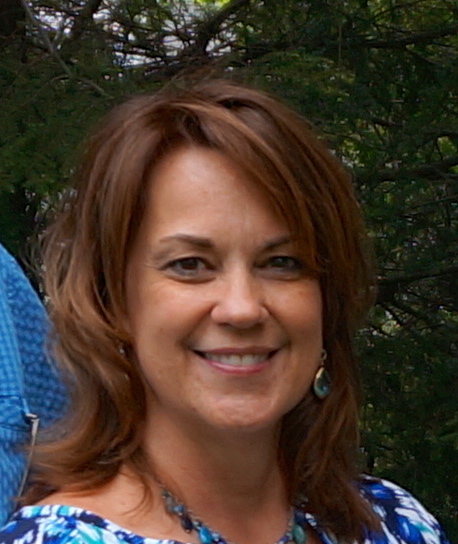 Thank you, Susan. Comfort food and friends are a perfect mix.